Two experts provide an unprecedented and fascinating look at what may happen in the future of business, citizenship, politics, privacy, terrorism, and diplomacy. Foreign policy analyses written by CFR fellows and published by the trade presses, academic presses, or the Council on Foreign Relations Press. 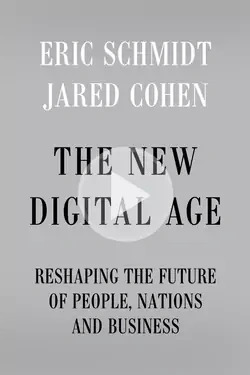 "Soon everyone on Earth will be connected," write Jared Cohen, CFR adjunct senior fellow and director of Google Ideas, and Eric Schmidt, executive chairman of Google, in The New Digital Age: Reshaping the Future of People, Nations and Business. In a book the New York Times calls "prescient and provocative," the authors argue that citizens will have more power than at any other time in history and weigh the costs of this access, particularly to privacy and security. Cohen and Schmidt forecast the promise and perils of the coming decades, from technologies that affect everyday life to political revolutions that are sweeping the globe. Concepts such as "virtual statehood" and "Internet asylum" will arise to protect dissidents and oppressed minorities, while tech-savvy autocracies—and even democracies—will find they can exploit their citizens' mobile devices for ever-more-ubiquitous surveillance. The New Digital Age addresses the most important questions raised by the proliferation of new technology: Who will be more powerful in the future—the citizen or the state? Will technology make terrorism easier or more difficult to carry out? How much privacy and security will individuals have to give up when they opt in to the new digital age? How will war, diplomacy, and revolution change when everyone has access to information technologies? Over the course of their research, the authors interviewed a cadre of international figures—from WikiLeaks cofounder Julian Assange to former Mossad chief Meir Dagan—who offer their visions of a technology-saturated future. Ultimately, Cohen and Schmidt stress "the importance of a guiding human hand in the new digital age. For all the possibilities that communication technologies represent, their use for good or ill depends solely on people. Forget all the talk about machines taking over. What happens in the future is up to us." [Schmidt and Cohen] encapsulate a vast sweep of ideas, including personal citizenship online and off, censorship of electronic information as national policy, and even what future revolutions will look like in years to come . . . A thoughtful and well-balanced prognostication of what lies ahead. This work of futurology combines optimism and pessimism in an informed and level-headed presentation. Ambitious [and] fascinating . . . [this] book is filled with tantalizing examples of futuristic goods and services. This is the most important—and fascinating—book yet written about how the digital age will affect our world. With vivid examples and brilliant analysis, it shows how the internet and other communications technologies will empower individuals and transform the way nations and businesses operate. How will different societies make tradeoffs involving privacy, freedom, control, security, and the relationship between the physical and virtual worlds? This realistic but deeply optimistic book provides the guideposts. It's both profoundly wise and wondrously readable. Every day, technological innovations are giving people around the world new opportunities to shape their own destinies. In this fascinating book, Eric Schmidt and Jared Cohen draw upon their unique experiences to show us a future of rising incomes, growing participation, and a genuine sense of community—if we make the right choices today. Eric Schmidt and Jared Cohen have produced a searching meditation on technology and world order. Even those who disagree with some of their conclusions will learn much from this thought-provoking volume. This is the book I have been waiting for: a concise and persuasive description of technology's impact on war, peace, freedom, and diplomacy. The New Digital Age is a guide to the future written by two experts who possess a profound understanding of humanity's altered prospects in a wireless world. There are insights on every page and surprising conclusions (and questions) in every chapter. For experts and casual readers alike, Eric Schmidt and Jared Cohen have produced an indispensable book. Jared Cohen and Eric Schmidt have written a brilliant book that should be required reading for anyone who wishes to understand the huge ramifications of the Age of Google not only for our lifestyles but, more importantly, for our privacy, our democracy and our security. If you already know about the law of photonics, data remanence, Stuxnet, Flame, DDoS attacks and CRASH (the Clean-Slate Design of Resilient, Adaptive, Secure Hosts) then you can probably skip it. If, like me, this is all news to you, you had better download The New Digital Age today. The 'technoptimistic' case will never be more smartly argued. The New Digital Age is must-reading for anyone who wants to truly understand the depths of the digital revolution. Combining the skills of a social scientist and a computer scientist, Schmidt and Cohen blend the technical and the human, the scientific and the political, in ways I rarely saw while in government. They challenge the reader's imagination on almost every page. This is a book that describes a technological revolution in the making. How we navigate it is a challenge for countries, communities and citizens. There are no two people better equipped to explain what it means than Eric Schmidt and Jared Cohen. Few people in the world are doing more to imagine—and build—the new digital age than Eric Schmidt and Jared Cohen. With this book, they are looking into their crystal ball and inviting the world to peek in. The New Digital Age offers an intriguing fusion of ideas and insights about how the virtual world is intersecting with the 'Westphalian order.' It seeks a balance between the discontinuities of technologists' 'revolutions' and the traditionalism of internationalists' study of states, power, and behavior. The authors explain that technology is not a panacea, yet the uses of technology can make a world of difference. This book should launch a valuable debate about the practical implications of this new connectivity for citizens and policy makers, societies and governments. We have long needed an incisive study of how the ever-evolving world of technology leaves almost no aspect of life unchanged. We have it in The New Digital Age. Eric Schmidt and Jared Cohen offer a rigorous approach to decoding what the future holds in a story that is as well written and entertaining as it is important. At last, a brilliant guide book for the next century—what the future holds for entrepreneurs, revolutionaries, politicians, and ordinary citizens alike. Schmidt and Cohen offer a dazzling glimpse into how the new digital revolution is changing our lives. This book is the most insightful exploration of our future world I've ever read, and once I started reading I was simply unable to put it down. This brilliant book will make you re-examine your concepts of the digital age, the way the world works, what lies ahead, and what all this means for you, your family and your community. A must read. Nigeria, Africa's largest economy and most populous country, is a representative example of the challenges Africa faces with internet connectivity. What steps can the country and the rest of the African continent take to increase the number of internet users? Caught Between Giants: How Will Israel Navigate the U.S.-China Tech Cold War? Given its close diplomatic and security ties with the United States and its growing economic ties with China, where does Israel stand amidst the U.S.-China trade war?